Dinnertime rolled around last week and I found out the kids wouldn’t be home for dinner unexpectedly. What could I whip up for just two of us at the last minute? (I didn’t want to use up the groceries I’d already organized for a whole family dinner.) The perfect, easy answer? 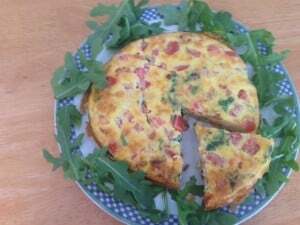 A frittata! I knew I had onions and tomatoes out on the counter. What else? I remembered some leftover potatoes in the fridge…that would be a good addition. I opened the fridge…oops, no potatoes. My husband must have taken them to work for lunch. Aha! A few leftover strips of bacon from Sunday morning and a bunch of arugula. Perfect. Chopped the onion, tomatoes, arugula and bacon. Shredded some Parmesan cheese. Put a couple of tablespoons of olive oil in a pan and heated it. Tossed in the onions and cooked for a few minutes until they were translucent. Threw in the arugula for a minute. Beat 6 eggs and a splash of milk and then stirred in the tomato and Parmesan. (If I’d been making this for 4 or 5 of us, I’d have used 10-12 eggs in a 10” skillet.) Poured the egg mixture into the pan over the arugula and onions. So far? About 10 minutes. Then I cooked in the pan for a few minutes over medium heat and put the oven-safe pan into a 350 oven for about 15 min until the frittata was firm in the middle and voila! Whatever’s-in-the-Fridge Frittata! The beauty of this is that tons of other options would have worked, too. The leftover potatoes, sliced, would have been yummy (did that one a couple of weeks ago). Leftover veggies of any kind, chopped, would have been perfect. How about some bell peppers? Yup! Leftover baby kale or spinach, cooked or raw? Yes again. Any kind of cheese, too….cheddar, mozzarella, feta, cream cheese all would be delicious. A great way to use up bits and pieces from the fridge and come up with dinner at the same time! 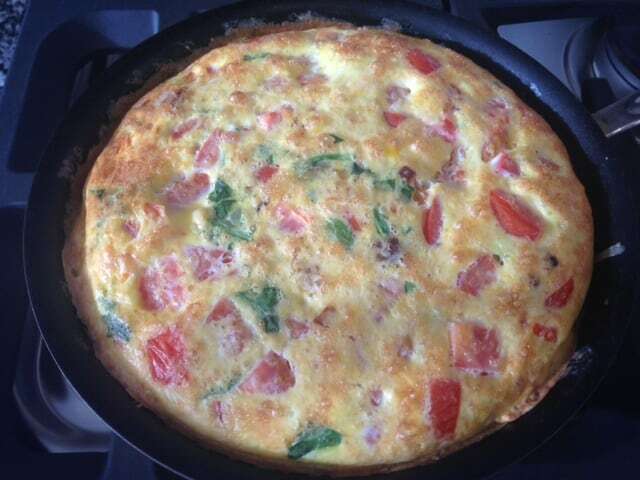 And a frittata looks great on the table – you’ll feel good about what you are serving. Next time you feel like an easy clean-out-the-fridge lunch or dinner, give this one a try! 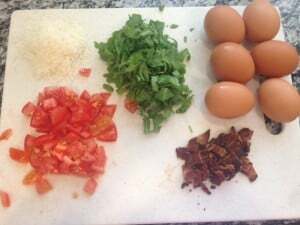 Like quick, easy, healthy meals? Learn more about The Dinner Daily. The meals have been easy and delicious. And I feel well balanced nutritionally. The Dinner Daily saves me time and peace of mind my family is eating well.